Mujitsu and Tairaku's Shakuhachi BBQ / Hiroshima Buddha. Remains of a buddha statue from a temple near 'Ground Zero' after Hiroshima A-Bomb attack, 06th August, 1945. 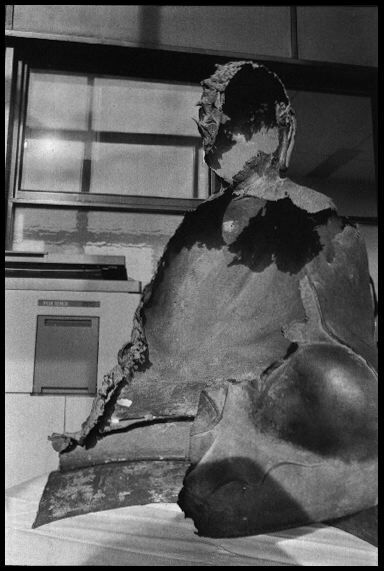 "This bronze Buddha was melted by heat from the Hiroshima bomb. Bronze melts at around 1600 degrees F. The temperature on the ground beneath the exploding Hiroshima bomb reached about 7000 degrees. Hiroshima Peace Museum, Hiroshima, Japan. November 13, 1984."